Full service professional photography studio in Phoenix / Scottsdale, Arizona. High end advertising, corporate, editorial & commercial photography since 1988. • Advertising Photography / Lifestyle Photography / Portraiture - CB Photo is a full service studio, still and video production resource with in house photography production coordination capabilities including location scouting and casting and digital post production services. ﻿ The professional photography portraits included here reflect why CB Photo is considered to be one of the best advertising photographers and portrait photographers in Arizona. • Portrait Photography -CB Photo principal focus is location and studio portraiture. Assignments have taken him to locations world wide. Portraiture portfolios include celebrity portraiture, family portraiture, corporate/executive portraiture, editorial portraiture, and private commissions. Chris' ability to work with his subjects during every shoot with clear feedback, direction and sensitivity is without peer. • Celebrity Portraiture - ﻿CB Photo is the most experienced celebrity photographer in Phoenix. His highly developed people skills, collaborative style and familiarity with this niche market puts him at the top of a short list of Phoenix based celebrity photographers. His celebrity portraits are internationally syndicated by Shooting Star Agency / Los Angeles. ﻿﻿ ﻿﻿A partial list of these portrait sessions is included in this site. • Editorial Photography / Editorial Portraiture- CB Photo editorial photography credentials include over 800 magazine covers and hundreds more feature story illustrations & environmental portraits. Much of his editorial work and photo illustrations are syndicated through H.Armstrong Roberts (Philadelphia). • Commercial Photography - This portfolio includes a selection of commercial lifestyle, website, product, catalog, packaging, and industrial photography. • Headshot Photography - This head shot photography portfolio includes actor headshots, modeling headshots, glamour headshots, business headshots, theatrical headshots, commercial headshots, corporateheadshots. The corporate headshot portfolio includes many examples of head shots taken on location and in the studio as well as good examples of lifestyle headshots, environmental headshots and corporate head shots for employees and entire staffs. • Resort / Spa Photography - This is a specialized photography portfolio focused on professional photography photos of hotel, resort and spa photography which represents CB Photo second largest corporate photography client demographic. 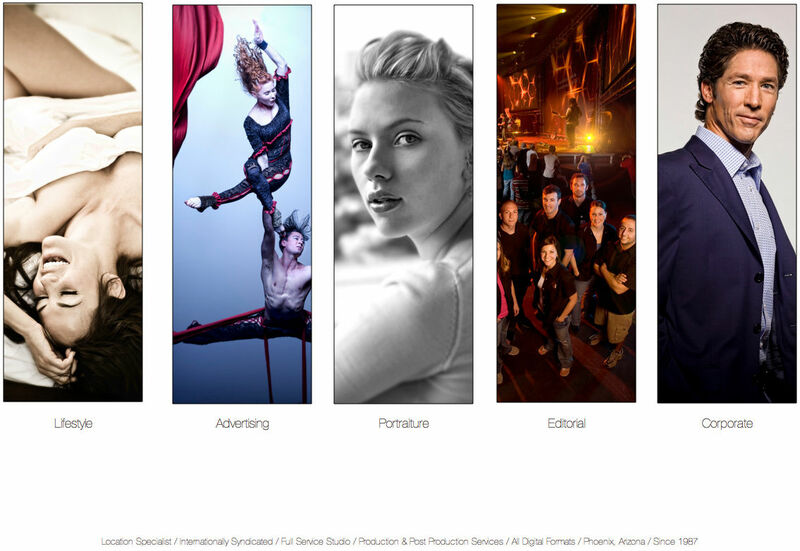 A list of these clients can be viewed on this photography site. • Corporate Photography / Corporate Portraiture - Our corporate photography clients include many fortune 500 companies and high profile businesses in the entertainment, publishing, healthcare and manufacturing sectors. ﻿Our corporate photography services include production coordination, in house stylists, digital & post production technicians and location services for producing the finest executive portraiture, headshots, annual report photography, website, marketing & publicity photography. In addition, our small business photography﻿ division offers lower priced corporate photography services via our staff of highly experienced Phoenix professional photographers. Other Christopher Barr Photography related websites available on line for review include: Commercial and Theatrical Headshot Photography, Corporate Headshot Photography his Blog and Internship Program Portal. •Photographs appearing in this site are the exclusive property of Christopher Barr unless credited otherwise. All images created by Christopher Barr or his staff are protected under international copyright laws. No images within this site fall under the classification of public domain. •Please note that Christopher Barr's agents and syndication agencies regularly search the web for unauthorized reproductions of images and copyright infringement. All cases of use infringement are aggressively discouraged and pursued for fair compensation and penalties to the fullest extent of the law.